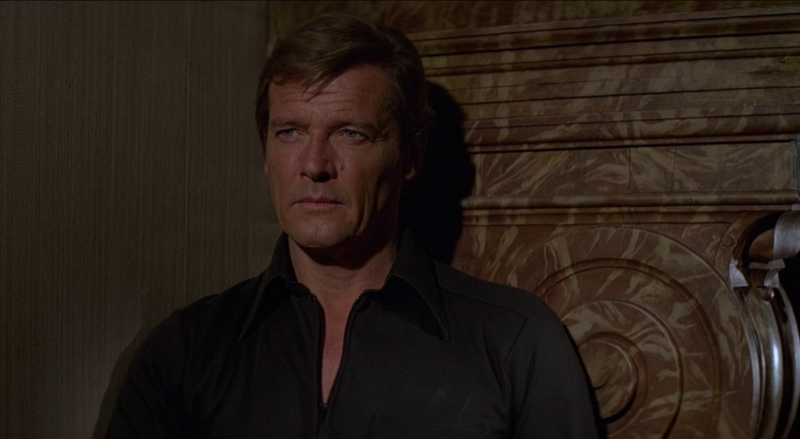 Bond wears an all black outfit for two nighttime excursions in Moonraker. The black knit shirt is unique for it’s zip that goes halfway down the chest. The zip fastening is black and has a fine tooth. The shirt has a point collar (the same point collar that Frank Foster made for the rest of Moore’s shirts), a patch breasted pocket and single-button mitre cuffs with smoked mother of pearl buttons sewn with black thread. The material of the shirt is most likely a soft polyester. The slightly flared trousers have a plain front with one pocket on the back right but none on the sides or front. Bond wears a black belt with a brass buckle, matching his black, leather-soled horse-bit slip-ons. 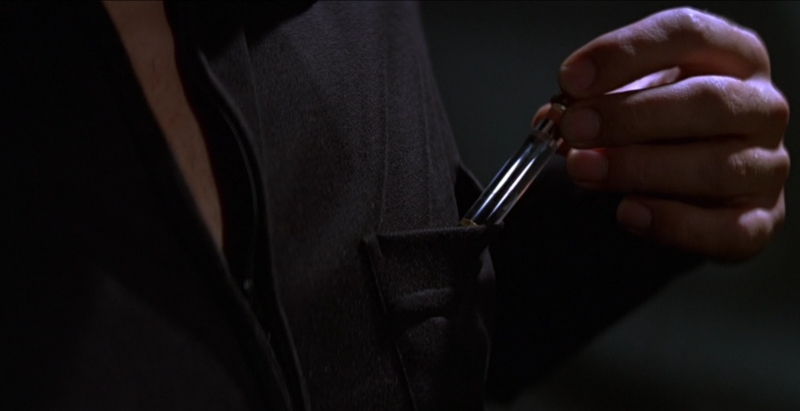 From Goldfinger on, one constant seems to be that all of the Bonds look great in all black. I’ve always thought that they look better in navy than black. Especially Pierce Brosnan. I love how Bond always wears leather soled shoes to go sneaking out and about at night. I had been looking forward to this post, Matt. This outfit was the first one that really influenced me as a young teenager, to have an interest in dressing in the style of James Bond. Funny enough though I never looked closely enough at the shirt to see it was a zip rather than buttons (perhaps not clearly visible on account of the colour) until much later. Nevertheless, it is an example of classic and stylish casual wear which, barring perhaps the long collar points and flared trousers, would work just as well 33 years from when this movie was made. My only caveat is the “polyester” attribution. I agree that this shirt does have that appearance particularly from the close up of the pocket, however, I honestly can’t see Foster using polyester, which is always viewed as a cheap, synthetic material. 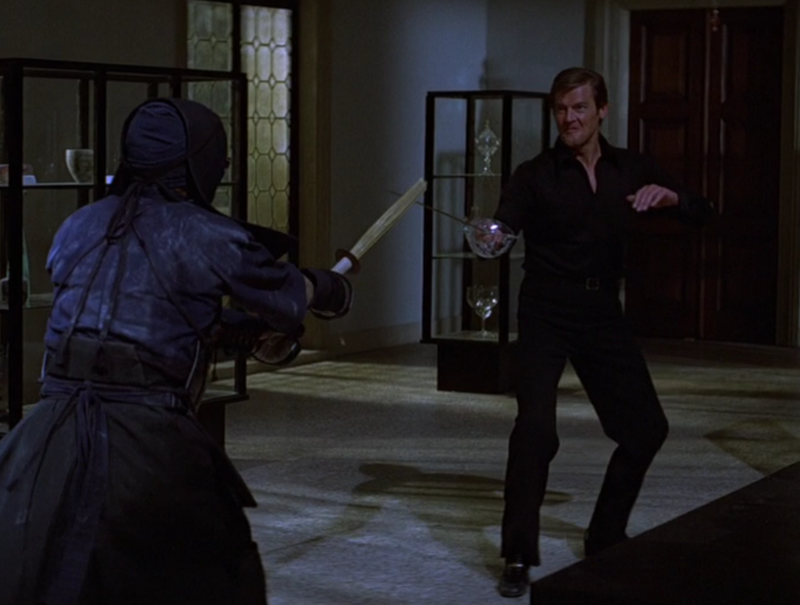 Moore’s previous black shirts in Live and Let Die and The Spy Who Loved Me were both silk. Perhaps, if it really was polyester it came from another manufacturer? After all some of Moore’s clothing (the dinner suit from TSWLM for example) was produced by an Italian clothing house at this time. Just a thought. the evening wear in TSWLM was Hayward. The Italian clothing was for TMWTGG and was by Angelo’s of Rome- who also supplied much of Ian Ogilvy’sd wardrobe as the Saint. Actually the dinner suit in The Spy Who Loved Me was by Angelo, and it was sold at Christie’s in 2001. Cyril Castle still made all the suits for The Man With The Golden Gun, and some were sold at auction proving the Cyril A. Castle label. 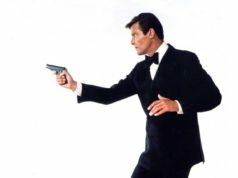 The suits in The Man With The Golden Gun have the same cut and detailing as the suits in Live and Let Die. The style changed in The Spy Who Loved Me and Moonraker, when Moore used Angelo for a few years. Douglas Hayward did not come in until For Your Eyes Only. 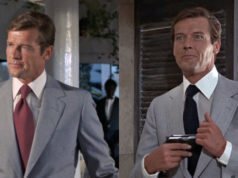 There is a considerable change in the cut of the suit from Moonraker to For Your Eyes Only, and there is no way the same tailor would have made both styles. Tailors cut their suits a certain way and don’t vary much from that. The cuts are nothing alike. Angelo cut a straight, padded shoulder whilst Hayward cut a natural, soft shoulder. I hope this clarifies things for you. Sorry I’m a bit late returning to this thread. having been highhly dubious that a respectd London shirtmaker would produce a shirt in polyester I spoke directly with Frank Foster a couple of weeks ago and he confirmed that, while he did make shirts for Moonraker, he didn’t recall producing anything like this and didn’t, generally, work with polyester (although i’m sure if a cutomer had specific wish for it he would). He suggested it was probably something spotted abroad which the producers or Moore himself liked and thought would work. Hi Guys. I’m currently talking to Indy @ Magnoli about having the amazing Roger Moore era black half zip shirt re-created for our pleasure. Would you be interested in one? Initial pricing is coming out at around $125. Just gathering interest at moment. Would you be interested in ordering in 2014? Hi Mark. Only spotted this now but I certainly would!